Data Everywhere makes it easy to keep the same data up-to-date across multiple spreadsheets. Follow along with this five to ten minute tutorial to see just how easy it is! 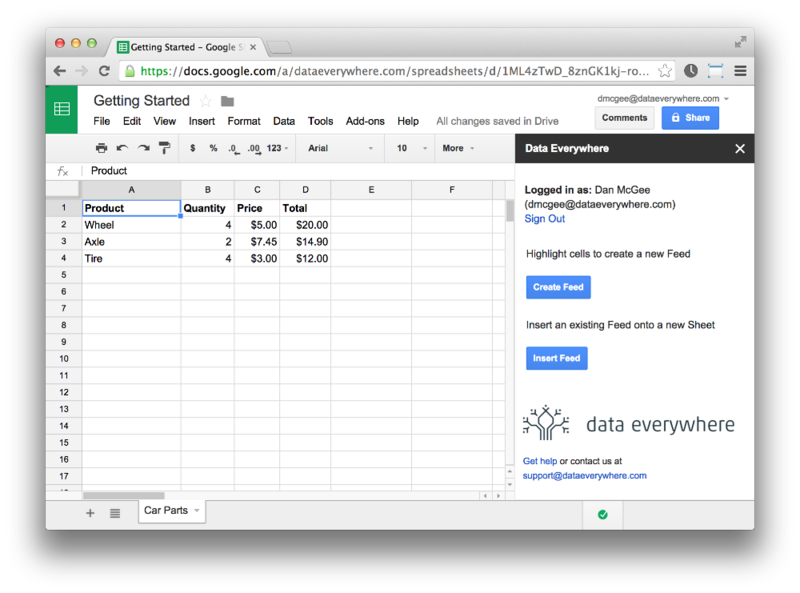 Data Everywhere allows you to share data using a "feed", which is a set of data you have in a spreadsheet. Imagine you are tracking inventory for your model car parts and how much you spent on them. Copy and paste the below table into a new Google Spreadsheet, starting in cell "A1". Once you have data in Sheets you'd like to publish, we'll want to share this data using the Data Everywhere add-on. Note that "sharing" the data might mean you only share it with yourself, your data is private unless you explicitly share it with others. If you do not have the add-on installed, please follow the add-on installation instructions and then return to this tutorial. If you do have it installed but cannot see the sidebar, select the "Add-ons" menu, then "Data Everywhere", then "Start". Select the cells containing the sharable data (A1 through D4) and choose "Create Feed" in the Data Everywhere sidebar. Give it a descriptive name such as "Car Parts", and optionally provide a description. Click the "Create Feed" button at the bottom of the dialog. Congratulations, you've now created a Data Everywhere feed! This means that this data is available to insert in any other Google Sheet or Excel Workbook you may have. By clicking the "Details" link in the sidebar, you can even add other viewers and editors to the feed so they can use your shared data. Sharing data isn't very helpful if you aren't using it somewhere. Data Everywhere makes it easy to do so. Let's open a completely new Google Spreadsheet to see just how easy it is. Once again, you may need to open the Data Everywhere Add-on in your new spreadsheet by clicking the "Add-ons" menu, "Data Everywhere", and then "Start". Once the Data Everywhere sidebar is visible, click "Insert Feed". A list of available feed will be shown, one of which should be "Car Parts" (or listed another name if you chose your own). Click the "Insert" button to add this data as a new sheet in your spreadsheet. The data you shared earlier is now available in your new spreadsheet, and will be instantly updatable whenever changes are published! Time to make some quick updates. Column "D" should really be a formula, so in cell "D2", enter the formula ` =B2*D2`, and then drag down to fill the rest of the column with the same formula. We also realized we had 8 tires available, so change that quantity. To publish these changes, click the "Publish" link in the Data Everywhere sidebar next to the "Car Parts" feed. This will take the updated data from your spreadsheet and send it to our cloud database, and now any other spreadsheets that reference this data will be notified there is updated data available. Flip back over to our original spreadsheet. You'll notice the sidebar will say "Update Available" next to the Car Parts feed, letting us know the data has been changed elsewhere and we should refresh to get the latest. By clicking the "Refresh All" button, your two spreadsheets will effortlessly be in sync, with no copy-pasting of data or wondering if you have the latest version. You'll see the quantity of tires will change to 8, and the formula changes we made to column "D" will also be reflected in your spreadsheet. Adding and removing rows is no problem either; Data Everywhere will share all new data if present in your worksheet.